Boat is used to place an image and link for a vessel on a trip (product) page, to help customers find boat specific information. Trip need to be manually linked via product codes in this content type. Campaign content is for non-permanent site content related to a promotion, campaign or short term partnership. As a result it's usually not linked to the main site navigation, except via the Travel Deals section. Content Collections are used to store content (images and text) that can be formatted to display on a page in various ways. Destination content has a pre-formatted display, with editable fields such as introduction text, highlights and images, as well as infomration in the FAQs. Pages are used for evergreen permanent site content that requires bespoke formatting. Product content has a pre-formatted display for all trips. The majority of editable product content is automatically fed from the Hybris Content Management System, or linked to Elements. Webforms are used to collect custome data, with the ability to tailor the customer flow. These are used for competitions and promotions. Data is saved in Drupal, and can be automated to email a nominated address. Promotion Webforms are editable webforms similar to webforms where customer data automatically feeds to Salesforce. *When logged in you will only see the above content types as defined by your role in Drupal. Go to Content and Add content. Select the Page content type. You will be taken to the editor where you can add content. Select the Campaign content type. Go to the page you wish to edit. Select Edit tab from the top of the page. Page / Campaign title - This is the title that shows on top of the banner image at the top of the page and is the H1. It is important the Page Title is optimised for SEO if the page is a permanent page and to be indexed by Google. Banner image - The image that shows on the top of the page. The banner image must be 1920 x 500 pixels in size, 72dpi, save for web. Active date - Select when you would like the page to be live/come down. All time periods outside what has been specified will be re-directed to a 404 page. Body - This is where you add the content of your page. You can add images, style copy, insert columns, and add content using the icons in the editing bar below. WYSIWYG stands for "What you see is what you get" and is the area where you make all your page content edits. Select the link icon and a pop up will appear where you can add your link. The relative URL refers to the tail end of the URL i.e. the part of the URL which comes after the domain name. e.g. To link to http://www.intrepidtravel.com/en/asia you would use asia for the URL. Use anchors to link to places within a page. Anchors are especially useful for long pages where you have a lot of content. They can also be used to add a side navigation to your page. Select the pin icon to "insert H2 anchor"
Save the page - your menu will now display down the right hand side of the page. Your content will respond with the screen size, and move to a one column display on mobile devices. Create your table and table content. Place your cursor inside the table. Select the table style you would like to apply from the Styles drop down. Table style options include: Table, Striped, Hover, and Striped & Hover. Type the text you would like your button to display in the WYSIWYG. Link the text that you want to show on the button to the page you would like it to direct to. NOTE: For the button to work all the text that you want to show on the button must be linked. Place your cursor within the linked text and select the button style you would like to apply from the Styles drop down. Button style options include: Default, Primary, Secondary, and Tertiary. Content collections are used to group together pieces of content and then insert it into a page in the display you want. Content collections can be used to insert things like image galleries, accordion tables, or text with images on your landing page. Select the Content Collection content type. You will be taken to the editor where you can create a new content collection. Give your content collection a title that is something you will remember and is easy to refer to - the main title will not display anywhere on your content collection when inserted into a page. Title - this will show as the visible copy on an accordion display, or heading or overlay text for other displays. Body - this will show as the copy when an accordion display is expanded, or text below or next to an image for other displays. NOTE: Not all of these fields are compulsory but you will need to add at least one. To add a new item to pull to your content collection click "Add another item". Aggregate shortcodes are used to insert custom content (created via a content collection) into a page. Get the node ID from your content collection by editing the page and copying the node ID from the URL. These are cross-country food tours designed to fully immerse you in a destination's food scene. Taste the freshest market produce, meet artisanal producers, find the best street food and learn the subtle changes in regional cuisine. But although these trips are packed with flavour, we haven't left out the essence of Intrepid travel: each real food adventure is filled with cultural exploration, historic highlights and plenty of grassroots travel. They're just seasoned to perfection - food travel at its best! Select the red P from the WYSIWYG menu. Primary country or countries visited - use the country's two letter code e.g. AU for Australia. A list of these codes is available here. Display order - you can order by marketing rating (default), traveller rating, or price. After setting the products you want to display, you will need to set the way you want the products to display from the output tab. After setting the reviews to display, you will need to set the way you want the reviews to display from the output tab. Category - each blog has been tagged with a category. If there are particular blogs you want to bring in to a page contact the copy team and they can arrange for the appropriate tags to be added for you. Click share and copy the URL from the field below - this is the URL you need to enter for the shortcode. Set your display width - this will default to full width but you can adjust for a range of sizes if need be. ​You also have the option to select if you want padding on the shortcode, or if you would like pagination on the carousels. To enusre that the content inserted via a shortcode displays best across devices you can set how many columns/slides of content you would like to display for each screen size (mobile, tablet, desktop and desktop wide). When inserting shortcodes make sure you test your page across devices to see if your layout works well for each view. Merchandising is used to manage campaign content for the website via the one location. Using the merchandising function you can update the offers menu, notifcation bar and home and offers page tiles all from the one location. Go to Content > Merchandising > Add merchandising. In the landing page URL field enter the path to the campaign page e.g. for http://www.peregrineadventures.com/europe, use europe as the path. If your campaign is starting/ending on a specific date you can set the active date. Note the times are set to UTC so you may need to update the timezone for your region. Set the regions that your campaign is to be active for. If you do not set a region your merchandising will not show anywhere. Activate the type of merchandising you want to use for your campaign by adding content to one of the below sections. Which merchandising option gets first preference? Ordering of merchandising currently works off date, and the most recently created merchandising item will be put in the first position/override previous merchandising in the same position. If you want to bump an existing merchandising item higher or lower, use the active dates to adjust. The most recent date will be the first item, the oldest will be the last. This overrides the homepage banner. If you want your campaign to show in the offers menu set some text in the offers menu field. The menu item will link to the landing page URL you have set. The most newly added menu item will show first. NOTE: There is web caching on the menus so it may take a few hours for your changes to come through. Add some message copy - the wording that will show on the bar. Add a call to action - clickable copy which will link to the landing page you have set. Set the included URL - pages that the notification bar is to show on. Specify pages by using their paths e.g. for https://www.peregrineadventures.com/europe, use europe as the path. To show the notification sitewide just use * - if you are using sitewide makes sure to exlcude the campaign landing page as the user will just keep looping otherwise. Set included product codes - if there are particular trips that your campaign is applicable to you can set the trips it will show on by adding their product codes. Merchandising shortcode is used to set the campaign tiles for the homepage and offers page. This shortcode can also be used if you would like to feature all available offers on a landing page. Upload your campaign tile to the image field (size 1100 x 735 px). Add a title - this is the text that will show over the image. Add a call to action - the call to action text will show on a button. Select the red M at the top of the WYSIWYG. Select your preferred display and layout type. Active campaign tiles for your region will now show on the landing page. Promotion content in trip pages is used to add campaign content to trip pages (mainly used for Qantas at the moment). When this merchandising type is added it will show below the departures on a trip page. Add the codes for the trips that you want the content to show on. Promotion content in destination pages is used to add campaign content to destination pages (mainly used for Qantas at the moment). When this merchandising type is added it will show below the trip carousel on a destination page. Add the URL for the destionations that you want the content to show on (e.g. czech-republic or ecuador). 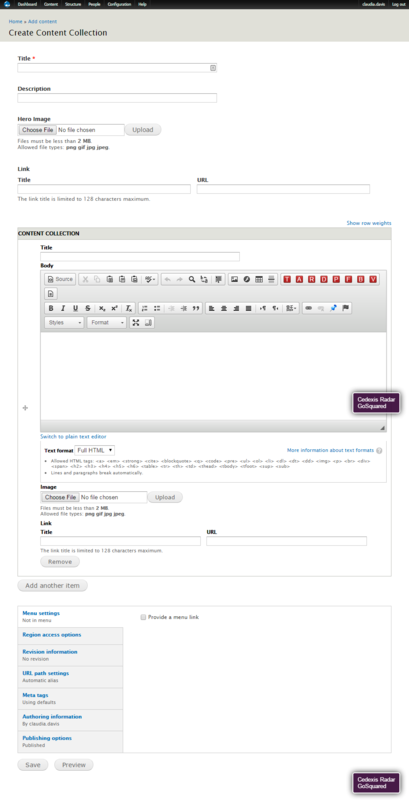 Select the Webform content type. Give your form a name and save it. You will not be able to add components to your new form until it has been saved. After saving you will be taken to the Webform tab where you can add each of your form fields. Set the type - refers to what type of display and input the field is designed for. If a field is compulsory tick the Required checkbox. After adding the component you will be taken to a page where you can further refine your component, and save the component as a new form field. Email - use whenever an email address is required. Please use this over textfield when asking for an email as the email field type has validations on it to ensure we collect valid emails from entrants. Fieldset - use to group multiple form fields into one section, with a heading at the top. The heading will be the label (or you can hide this heading under the display options if you prefer). Number - use when someone needs to complete details that can only be a number e.g. phone number. Radio button - this is the default option. Use this option where the can only select one option and must select something. List box - use this option where the user has a long list of options to select and can only select one answer. Good for things like countries, states, etc. To enable a list of options as a list box, check the "Listbox" option under Display on the Form Components. Check box - use this option where a user can select more than one options, or selecting an answer is not compulsory e.g. opting in to email list. To enable a check box list, check the "Multiple" option above the options section on the Form Components. Text area - use when there is a large amount of text for a user to complete. Textfield - use when there is a small amount of text for a user to complete e.g. name, address. After creating your new webform go to the Form Settings page to set where the user will be re-directed after completing their form entry. Custom URL - create your own confirmation page for the form and then add the URL for this page to the field. The user will then land on your custom page after completing the form. No redirect (reload current page) - add some text to the Confirmation Message field at the top of the page, and this will show as a green notification to the user after they have submitted the from on top of the page. They will not be directed away from the page they completed the form on. After setting your conditions save your changes and then test them on the form. Go to the Emails tab and add the email address which you want to send notifications to for the form and click add. Use the "Custom" option which will send all notifications for all the submissons to the one address. Use the "Component" option which allows you to send notifications to different addresses based on what the user selects for one field e.g. you could send notifications for each region to a different email. To view the submissions to your form go to the results tab. From here you can view all the submissions to your form to date. You can also download all form submissions in an excel spreadsheet. Under Display set the Label Display to "none"
To insert select the red F at the top of the WYSIWYG and enter the node ID. Breadcrumbs are navigational links that we have at the top of pages on the website. Breadcumbs help users see where they are sitting in the site architecture, and also assist with SEO. Breadcrumbs will be applied automatically to pages that sit within the site's menu, as well as all trip pages but have to be added manually for new content on site that may not necessarily sit within a menu. This includes campaign landing pages. Navigate to the page and select the edit tab. Scroll to the bottom of the editor and select the "Breadcrumbs" tab, and click on "Create a breadcrumb to this node". This will take you to the breadcrumb editor where you can add the breadcrumb links for your page. Untick the "Send to all regions" tickbox and expand "Publish to specific region"
IMPORTANT NOTE: If you are using translation make sure the page is published for all regions you have translated the page for. What happens when I regionalise a page? If you leave the page on the default settings it will show a notification at the top of the page like the one below for all users outside the specified region. By ticking the "Overwrite the default alert" checkbox you can update the alert message to whatever you require. By ticking the "Overwrite the default alter" checkbox, and removing the message from the box all together, you can direct users from outside the specified regions to a 404 page. To set up your page URL, select the 'URL path settings' tab at the bottom of the editor. Untick 'Generate automatic URL alias' and add your desired URL path to the URL alias field. NOTE: The default URL is set to be based on the page title, so it's best to set this up manually and early. If you change the URL after the page goes live, then the original URL won't work. If you need a re-direct added please contact web support about this. Select the Meta tags tab at the bottom of the editor. When a new page is created the language default is English for the Rest of World region. To improve the experience for customers in other regions from a language perspective page content can be customised for a particular region (e.g. using "vacation" instead of "holiday" on pages for US customers). Note: Once you have translated a page any edits to the original page will not flow through automatically. Select the Translate tab at the top of the editor. Find the country you would like to translate for and select Add. Once you have added the language you wish to translate for you will be taken back to the editor. At the top of the page it will have the translation language and country in square brackets e.g. [English (Canada)]. This page will clone the content from the original page. Make any edits required to the page and save. The translated page will now be available at the URL for the specified region (e.g. http://www.intrepidtravel.com/ca/building-pages). The translated page will show to users coming to the page from the country the page has been translated for, or if navigated to directly via the URL. IMPORTANT: If you are translating a page make sure it has been published to all the regions it needs to be available e.g. if a page was created for Australia initially but will translated for other regions, it needs to be published for Australia and any other region it will be used for on all translations of the page. Navigate to the page and select the Translate tab. Select select edit next to the language/country you wish to edit. Automatic revisions show the last 5 saved changes to content (excluding webforms). Operations View: shows static view of previous revision. Use for page banner and as the hero image within a Content Collection (main image that shows on a tab). Use when you have a large amount of image showing together on the page (e.g. https://www.intrepidtravel.com/eu/asia under 'Destinations in Asia').